Howdy fellows electrical engineers, it’s Steven Mill! It’s been a while since I haven’t post something on this blog so here I am with a little article about 5 misconceptions existing around Power Cable. Have you got an idea of what I’m about to list? Anyway, in any case I hope you’ll enjoy this material and make comments right after! Let’s go back to basics with this article by A.N, an experimented member of the community. He chose to focus on electrical cable joints and we’re glad he did! If you too want to publish on the blog, send us a mail so that we can discuss. 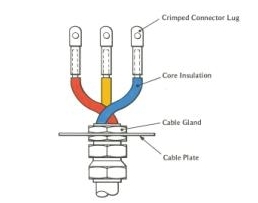 Electrical joints and terminations provide the required electrical connection as well as the mechanical support, and physical protection of the cable. There are different types of joints and terminations based on the function, type of cable and construction materials. The design is usually influenced by the voltage and current that the cable will carry and the operational environment. “Anyone who works with electricity knows that it is not something to joke with! If someone says that he is not afraid of the electricity then he has not seen the damage it causes. Therefore, in this article I will examine how to work safer and how we can avoid future accidents after the job is done. Selection of Power cables for given purpose depends on a number of factors. Hence selection of it is never a simple task. Selection is also made difficult as there is such a large variety of cables available in the market. Through this article we will see some of the important factors that determine selection of Power Cables. It is necessary to select a power cable capable of supporting a particular system voltage. In case of AC system, the rated voltage of power cable should always be equal to or greater than the system voltage. The exact rated voltage selection of power cable depends on earth fault withstand limits and specifications considerations that are made by the power system designers. For categories A and B – cables with same rated voltage as system voltage can be chosen. However, for Category C, the rated voltage of cable should be higher than system voltage. e.g. for 3.3 kV system voltage, a 6.6 kV rated voltage cable should be selected.